I’ve long felt there are fewer lesser art forms than the music video. It turns out I was wrong—or, at least pre-1990 it was another game. 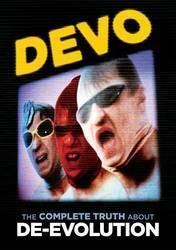 The Complete Truth About De-Evolution is a DVD compilation of all of Devo’s music videos (1976-1990, minus “Are U Experienced?”), running in chronological order, and it’s a spectacle to behold. Besides the high quality of the new age jams, the band were theatrical, thoughtful, and entertaining. The recurrence of themes across their career is an added bonus and it lends itself really well to this concept, making the 20 videos feel unified much more than one would expect over 14 years’ output. This was first released on Laserdisc in 1993 but with different bonus features and one fewer video. As many are most familiar with “Whip It,” let’s start there. The costuming and abstract art prop use is a common idea across the DVD and it’s well on display with their biggest hit. While the collection starts with the low budget “Devo Corporate Anthem,” which seems to have been filmed on a bowling alley stage, the seeds are in place early, from the creepy rubber masks to the hyperbolic displays of musicianship, and the use of ‘80s computers and TV color bars. Common ideas repeated in videos include playing instruments not actually in the songs, overly dramatized guitar solos, and recurring costumes and imagery. There’s also an ironic 1984-ish sense of conformity and doublespeak in use that also ribs on 1980s consumerism. For all the de-evolutionary meta-concepts at play, the band themselves utilize video art and costuming quite well themselves and that’s what makes this enjoyable. It’s not just a band mocking what’s popular, they actually have a theatric air that lends itself to entertaining viewing, not just being in on the joke. Favorite videos would have to the purple and green acid washed “Girl U Want,” with its throwback Ed Sullivan Show format but with the audience showing ludicrous innuendo towards the band onstage, and the nuclear disaster themed “Worried Man.” The earliest of the videos incorporate everything fun about 1980s videos: acting out the lyrics plot-wise, to the “use your imagination” acting that doesn’t bother with effects, but on the action/reaction instead of, say, a gushing bloody wound after a stabbing, here the victim here simple looks surprised and falls over. Point taken, onto the next idea. The collection is also a visual capsule to the band’s development, their commercial success, and their time period. The early videos are equally elaborate and colorful as the later ones, but the budget clearly increases and as things progress the use of green screens increased while the band’s placement in their own videos is reduced. Finally, the latter fifth of the DVD is lackluster, falling into late 1980s color tones and repetition. The idea behind “Post-Post Modern Man” and “Theme from Dr. Detroit” may be fun, but the songs are less exciting and the corresponding videos suffered from more traditional plotlines instead of the abstraction of their earlier work. (And for some reason “Dr. Detroit” is twice as loud.) However, the closing video to “Post-Post Modern Man (Rock Schenck Remix)” serves to illustrate everything that works with The Complete Truth About De-Evolution perfectly: it’s a shopping channel program that proudly sells off collectibles, starting with ridiculous concoctions and ending with a veritable trove of Devo costumes from the videos already witnessed on the DVD. They couldn’t have picked a better closer. Music videos may not get much airplay in my home, but this one will stick around in rotation. Posted Oct. 6, 2014, 8:52 p.m.
Posted Aug. 14, 2014, 7:50 a.m.
Posted July 12, 2014, 10:52 a.m.
Posted April 6, 2014, 10:16 a.m.